Start Brainstorming with 5 Funny Father's Day Gift Ideas! 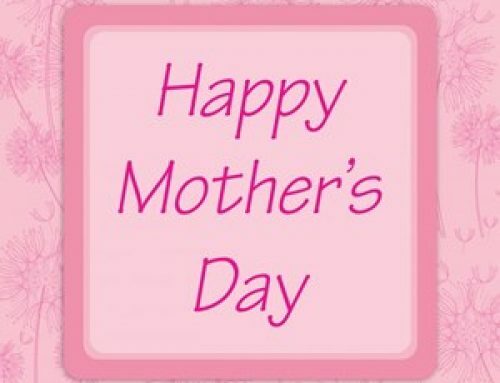 When June rolls around children all around the country rack their brains trying to think of the perfect way to celebrate their father and show appreciation for his role in their lives. From year to year it can often be tough to find original gifts for your dad on Father’s Day. You’ve already bought enough ties to last him a lifetime, all his golf clubs are still sturdy, and a Home Depot gift card seems like a cop-out. If you find yourself among one of those children looking for the perfect thing to get Dad this year, look no further. We’ve compiled a shortlist of funny Father’s Day gift ideas from Cardboard Cutouts that will be sure to have your dad in stitches. Most families have some great photos from years past that remind them of their dad, whether it’s poses at vacation spots, professional pictures, or everyday snapshots. One Father’s Day gift idea you could do is to turn one of those photos into a funny scene, with the help of some crafty photo editing. 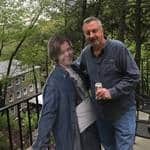 With Cardboard Cutout’s photo editing service, you can turn your family memory of dad grilling or playing catch with you into a standee with flair. We can even add body parts, text, or swap out objects. Turn an everyday item into a margarita or a balloon to add a playful element to the scene! If your family is more like a clan, never fear. While the largest panels we have are 47 by 95 inches, we can create larger cutouts with multiple panels if needed. Your dad will be sure to treasure a beloved memory or scene that he can keep around to make him laugh. Is your dad a sports fiend or a movie buff? If so, consider turning one of his favorite athletes or characters into a cardboard cutout with him. Your dad will crack up anytime he takes a look at himself hanging out with a celeb or fictional star. Simply find a picture of the person or thing, choose a photo of your dad, and upload them to our site to start turning it into a life-size gift that would be a perfect addition to any man cave. For a lot of people Father’s Day is a great excuse to have a party or barbecue to celebrate the man of honor. A perfect gift to liven up the festivities is a cardboard photo stand featuring your dad! 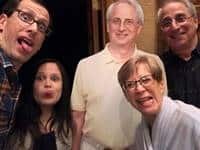 Just submit a photo of your dad, and we’ll edit and print the photo to your desired specifications, and you can order your photo booth as a full-body life-size cutout, or printed on a full rectangular sheet so that guest can hide well behind the picture for their photos. Plus, we have plenty of cool backgrounds as well to choose from that will make your standees extra fun. Guests will love having fun posing with your dad-themed photo booth! If you are bumming out about not coming home for Father’s Day this year, maybe you can make an appearance after all. 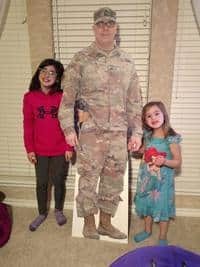 Using a life-sized cutout, you can create a cardboard version of yourself that will visit your dad on your behalf. Start by uploading a photo of yourself, listing your specifications, and we’ll take care of the rest, from design to shipping, right to your dad’s doorstep. 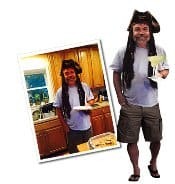 You can even edit the photo, adding speech bubbles, funny props, or other additions that will be sure to delight your dad and give the gift an even more personal touch. Maybe the easiest way to honor Dad is with… Dad? Make your dad chuckle by getting a lifesize cutout made from his picture. Choose a recent one or maybe find an old gem that reminds him of his younger years. Our Photo Editors can also help you turn the photo into the perfect fit for a lifesize cutout by fixing any missing body parts, removing any flash photo spots, and the like. We can work to make sure that your picture on the cutout will do justice to the man that it’s representing. The important thing to remember is that Father’s Day is that in the end it’s about the thought behind the gift you are giving to honor your dad. The good news is that you don’t have to break the bank to get him something really special either. Most of our standees range in price from $49.99 to $139.99. And what better way to show how much you think of him than a personalized gift that will make him smile? Check out our life-size and other cardboard cutout options for your Father’s Day gift today. You can simply upload a photo and be on your way. Order your cardboard cutout today to have it in by Father’s Day!